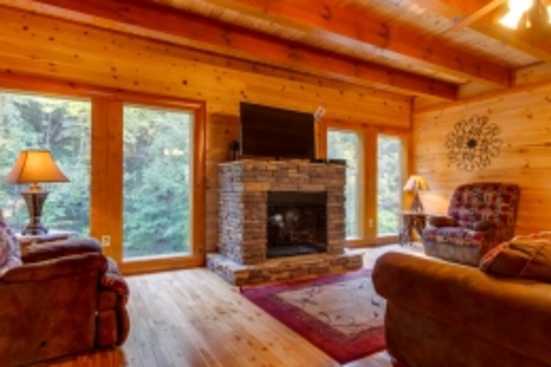 Welcome to Black Bear Ridge a three-bedroom two-bathroom cabin located in Pigeon Forge, Tennessee. Black Bear ridge comfortably sleeps up to six adults. Being in the foothills of the Smokies has its perks, such as you don't have to leave the resort area to find an abundance of hiking trails and large mountain peaks to scale. If you do decide to venture outside of the resort area the opportunities are boundless. You could head up to Smoky Mountain National Park and canoe through the river while taking in the wilderness. If you would prefer to stay dry, consider hiring a guide and tracking through the park to discover unique wildlife and hidden waterfalls. Once you have taken the time to adventure through different forestry areas head into downtown Pigeon Forge and take in one of the many unique dinners and a show opportunities. SmokyMountainsByOwners.com is the only place to book a one of a kind Pigeon Forge Tennessee vacation. SMBYO.com pride ourselves on providing an efficient and effective planning and booking process for all your Smoky Mountain vacation needs. Book with us, and enjoy a vacation you and your family won't soon forget.